the purchase. I paid $7.49 for a .41 oz. bottle and left the store. to semi-enjoy the trip we were on. do in a pinch. I preferred the Orajel formula much better though. I would also suggest that you get to the dentist as soon as possible to get the problem fixed or the pain will just keep coming back. These types of toothache pain relievers are only meant as a temporary aid until you can get to the dentist. I had an emergency case because I was far away from my home and my dentist. 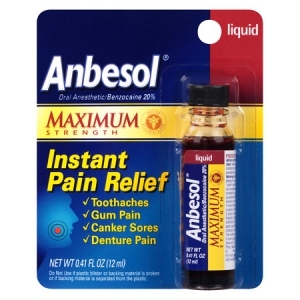 Anbesol will work better on minor toothache pain but for severe pain, there is only one real relief.